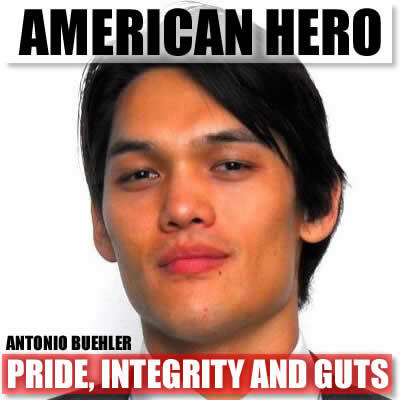 In the early hours of New Year’s Day 2012, Antonio Buehler, the designated driver that night, pulled into a 7-11 in Austin, TX for gas. While fueling up, he and his passenger observed a DUI stop in progress, with a woman in high heels performing a field sobriety test; according to Antonio Buehler, they heard a female screaming and turned in time to see officer Robert Snider pulling the female passenger out of the vehicle and throwing her to the ground. Antonio Buehler yelled out to the police, asking them why they were assaulting her. After twisting her arms behind her back, the officers arrested her. Then officer Patrick Oborski approached Buehler, pushed him forcefully several times in the chest, and arrested him. Oborski later claimed Buehler spit on him, a felony charge that carries up to a 10-year prison sentence. However, witness video evidence does not show Buehler spitting, Oborski did not wipe his face, and APD spokesman Corporal Hipolito admitted to KEYE news that he could not see Buehler spitting on the officer.